Renewed my membership and SASS sent me a 20 year membership pin. Impressive. Very nice of them! What does a 20 year pin look like? 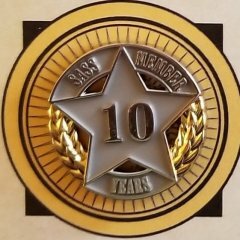 Me too, I joined in 1997 or 1998 and never got a stinkin' pin!! I'm frequently accused of being OFF my PINS Does that count. You don't have to be old to be a 20yr member! 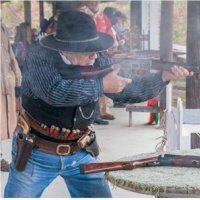 Interests:Free & Accepted Masonry, Cowboy Action Shooting, Amateur Radio, Wood Turning, Wood Carving, Welding. Guess were going to have to wait until the 25 year pins are sent out. Perhaps Life Members don't get pins. Got my renewal packet and my 10 year pin. Why would they give pins to certain people only??? Hey SASS are you reading this??? Good job SASS! Misty et al. there is your answer. these are for the annual membership. i hope there is something for the Life members also. That's what I was thinking. I've never gotten one either. My 20 years will occur in May. I'll let you know if I get a pin. Life member here. 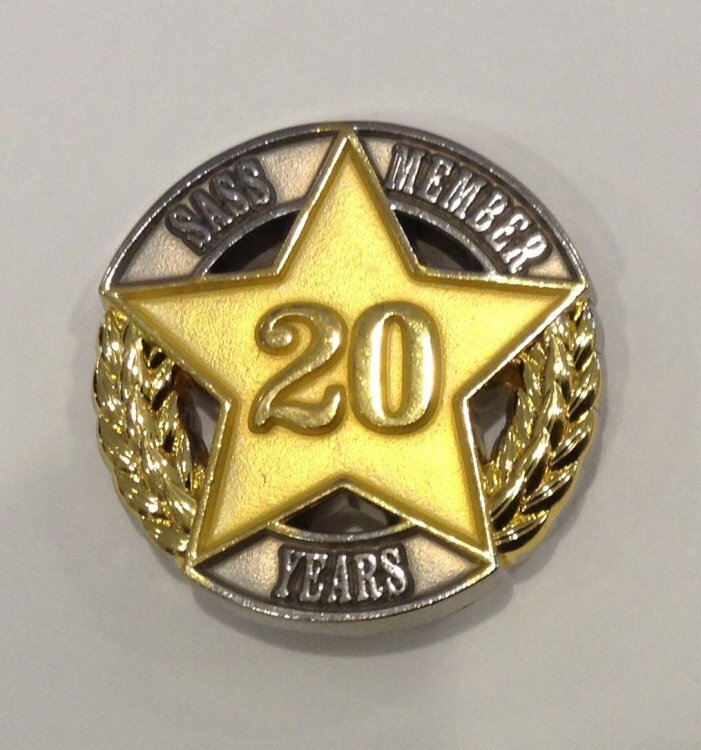 Hubby already hit 20 years in 2018 as an annual member and has not received a pin. I'm going on 27 years. No pin. 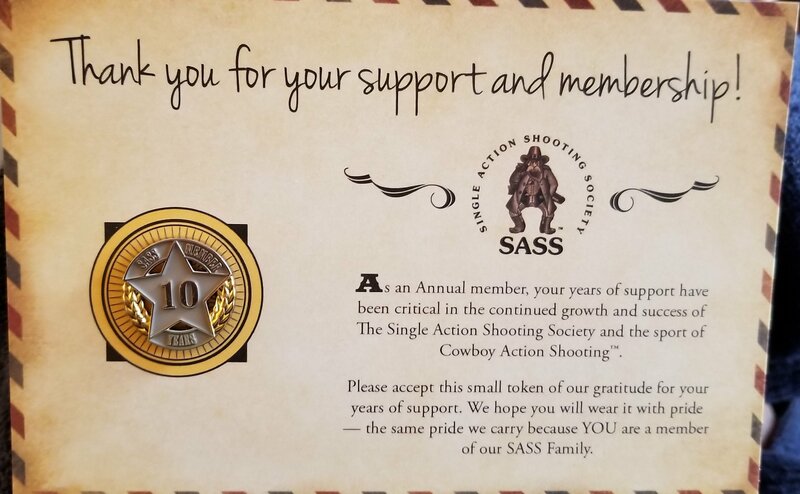 I'll bet SASS just started this and folks will get the appropriate pin at their next 10/15/20/etc. anniversary. All the pins, SASS Life, TG, Founders Ranch, TO II, posse, etc. we will look like coster mongers. All the pins, SASS Life, TG, Founders Ranch, TO II, posse, etc. we will look like coster﻿ mongers﻿. Any main match fixed sight revolvers. 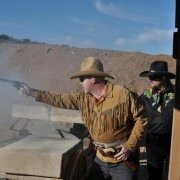 Any main match pistol caliber rifle. Must have at least 10 pins/badges. Hey Rye, joined 05/07/1997. That's over 21 years and no stinkin pin. It seems to me that this wasn't fully thought out. OR, every annual member over 10 years will receive an appropriate pin after their next renewal. I'm not sure whether it could ever include Life Members, as they seem to be thought of (based on previous posts on various threads) as a drain on funds, despite the loyalty shown by purchase of a Life Membership. Wow wouldn’t those look nice on vests, shirts, etc? Never got one for 10 years, went life after that. Guess we got another conspiracy for SASS to settle? I would like a 20 year pin! And every pin before that one too! I didn’t read if I went LIFE I would miss out, in fact this post is the first I have ever heard of tenure pins? They are very nice looking and a great idea. Hopefully all with appropriate years will receive one next year. That would be cool. Geeez; I have been a member since 1988 ( 30Yrs ) and have never received a pin. Mercy, Mercy. Misty Moonshine sent you a PM.